Current and sole owner of the villa is Krnovská škrobárna spol. s r. o.
Gustav Kandler (1852 – 1931) was the owner of a great steam mill in Krnov since 1879. He had this unique neorenaissance villa built in the neighbourhood of the mill around the year 1888. 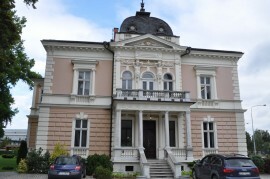 The villa was designed by a local builder Josef Hartel (1843 – 1914). In 1907 Kandler asked Leopold Bauer to rebuilt his villa. Bauer worked out three possible versions of the project. The first and the last version showed only slight adjustments, while the second version included some significant extensions and reconstructions. The exterior remained mainly unchanged, unlike the interior of the villa. 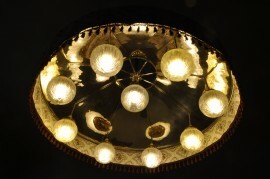 A salon, used as a smoking area, was furnished with an oval table with four chairs and a fire place with marble wings. In front of it, there was a round table with two sofas. A dining room is furnished with a right-angled table with chairs, a massive chest of drawers and a beautiful ancient clock. This room, as the only one, has been preserved in its original appearance up to now. In the bedroom, there was a large double bed and irregularly placed sofas and armchairs. The furniture used in the villa was of a soft style, bringing a relaxation and a peace. In 1907, the interior was published in prestigious magazines in Austria and Germany, but there was also a dark side of Bauer´s success. In 1911 Kandler had the villa extended with a rear wing and the villa lost its original renaissance harmony. 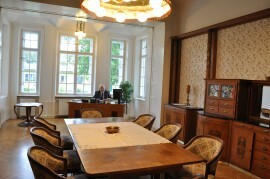 Mr. Hartel, a builder, supplemented the building with non-baroque elements. Builder´s family used to live in the villa till the end of World War II. After Heinrich Kandler´s death, the villa together with the mill changed the owner – mr. Múkusch. Then the villa was a property of the government since 1945. Since 2005, the villa is the property of Krnovské škrobárny company, which has been continuously renovating it ( new interiors, new facade). Especially thanks to the current company director and owner – Ing. Gogolín. He managed to return a part of the furnishings designed by Leopold Bauer to the villa. The floorplan of the villa originally consisted of 9-part disposition, so typical for Palladius´ villas. Later, the villa disposition was extended with one wing – the rear part of the villa. 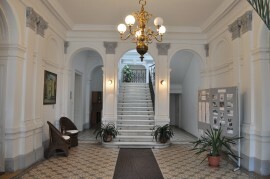 In the central wing, there is a hall with a staircase leading to the upper floor. A secondary staircase is situated just behind the main staircase and it is linked with loft premises. The whole rear wing is now used for housing. The main entrance is situated towards the garden, not to the street. The main entrance involves risalit with a veranda and a staircase, covered by the balcony. The balcony is supported by the system of pillars in a Tuscan style. 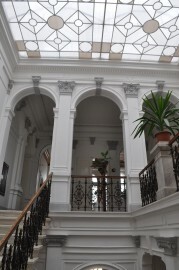 The railings in the entrance hall is formed by a balustrade, also appearing on the first floor by the balcony railings. Bauer was disappointed with a limited range of the reconstruction and he could not convince Kandler to receive the payment. He decided to go to the court. His correspondence with lawyers reveals the real intentions of Kandler villa reconstruction. An impulse for the reconstruction was an engagement of Kandler´s son with daughter of the greatest Krnov textile businessman – Larisch. The villa modification was to impress the bride not to change her decision to marry. The first version of the reconstruction did not meet any special enthusiam, therefore Kandler decided to underwent the second reconstruction, the larger one. Once the wedding was dealt on, he wanted to quit that. 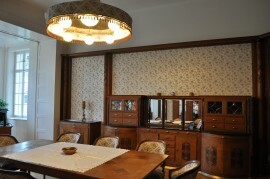 The last drop was the furnishings ordered by Larisch. In the end, Kandler rebuilt the villa in the last - the third - reconstruction. Despite Bauer´s winning over Kandler at the court, he had to pay for lawyers more than he got reimbursed. The villa is not accessible.